Doughnuts are one of life's most underrated pleasures. Whether you're happy, sad or just 'hangry', the sweet snack with the hole in it is always there. But while you may be partial to the odd Krispy Kreme or jam-filled variety, the standard glazed ring can get a bit samey so why not get creative and switch it up? We've scoured the web for the most inventive and tastiest recipes out there so you can indulge in the dough. No licking your fingers though! Whether you're a vegan, or just a fan of raw food, these raw peanut butter doughnuts look irresistible. 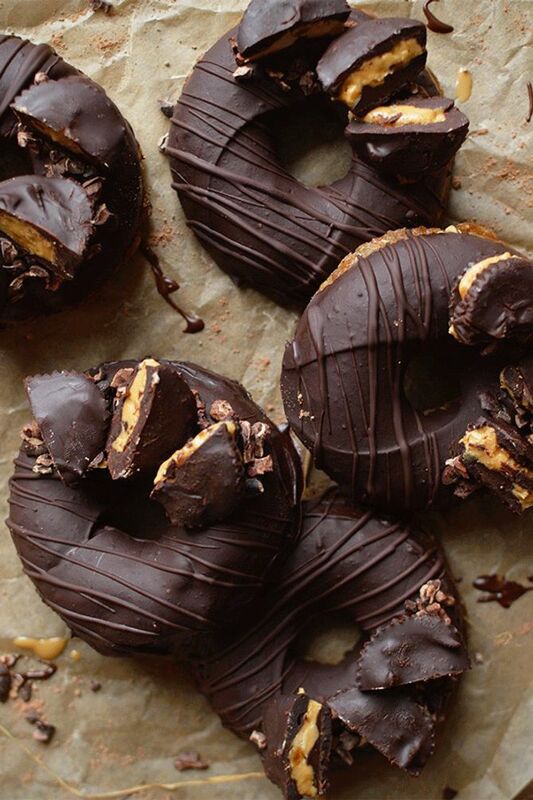 Chocolate orange brings back memories of smashing the Terry's ball to bits at Christmas, but these dreamy doughnuts are giving us a whole new yummy meaning. 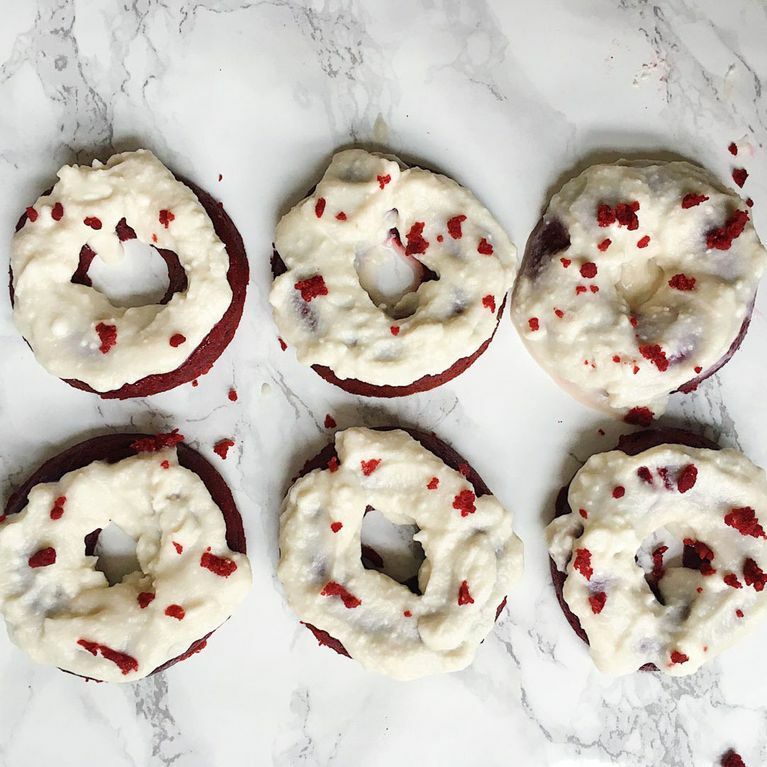 These doughnuts are brilliantly boozy and for that reason alone we're obsessed. Because Baileys is always a good idea. Believe it or not, these babies are actually healthy. Yes I'm being serious, they're gluten-free dairy-free, vegan and free of refined sugar as the frosting is made using cashew cream rather than y'know, regular cream. Yummy and guilt free? We'll take 100. Ditch the boring banana bread you always make and put those too-ripe-to-eat bananas to a different use, by making these moreish doughnuts instead. Give your 'nuts a fruity twist with this fun take on the classic. Totally counts as one of your five a day too, right? Dough you know the gingerbread man? Well he's no longer here as we think we baked him in these muffins. You've heard the phrase on the infamous Snickers ad 'get some nuts' but how about getting some doughnuts? If you thought alcohol and sweet desserts go well together you'd be right - and here's even more proof. These sweet apple cider doughnuts will satisfy every booze lover, guaranteed. Raspberries and white chocolate go together like gin and tonic so why not do the good thing and bring them as one in doughnut form? A guaranteed taste sensation. A sweet treat with a spicy kick. Chocoholics this is one for you. Inspired by the American classic, we need these chocolatey treats in our bellys like, now. Be the cat that got the cream with this yummy spin on the classic jam doughnut we all love. We've long been fans of coffee desserts because caffeine. But combining two of our fave desserts in one makes these a double winner. Yes these are as sugary, naughty and delicious as they sound. I mean, JUST LOOK AT THEM. Inspired by our favourite Spanish dessert, we're officially addicted. Ditch your morning Starbucks and reach for one of these to get your coffee fix instead. You've had mint choc chip ice cream, but have you ever had mint choc chip doughnuts? You haven't lived 'til you've tried these bad boys, just saying.